March 22, 2018 - Learn more about the new COPD personalized treatment proposed by the recent publication of the Canadian Thoracic Society (CTS). 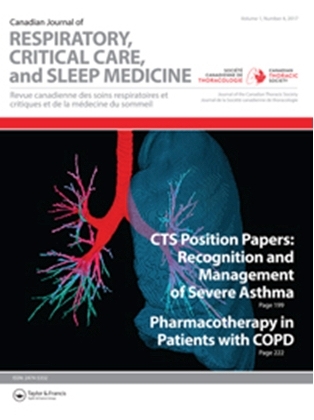 The Canadian Thoracic Society has recently published an update on the pharmacotherapy in patients with COPD. This new position statement is a must read for anyone providing care and working with people affected by COPD. This position statement is an evolution towards personalized treatment, compared to the previous published CTS COPD guideline. It promotes approaches to match treatment decisions based on symptom burden and risk of future exacerbations. It also presents key messages which best reflects the practice in Canada on the assessment, diagnosis and pharmacotherapy of patients who have COPD with features of asthma also known as Asthma/COPD Overlap (ACO). You will learn about the step-wise approach to choosing maintenance pharmacotherapy to alleviate symptoms and improve quality of life in stable COPD. You will be able to recognize and utilize effective interventions and strategies to improve the care for patients suffering from COPD by reducing the frequency and severity of AECOPD. You will understand the current gaps in knowledge regarding Asthma/COPD Overlap (ACO) and the key messages regarding the diagnosis and management of ACO. Click here to access the full CTS position statement on COPD.